Discover why the DynaPier® is the best foundation pier on the market. See the foundation pier comparison below. The DynaPier® foundation pier was engineered to be the best foundation pier available. The DynaPier® is one of the only piers constructed of both steel and concrete for superior strength. The piering system concentrically loaded, meaning is installed directly underneath the footing. We do not drill into the footing for installation, this weakens the foundation. At Warner Brothers we believe it is important to educate the general public on the different types of foundation piers on the market. The more informed the consumer, the better the choice they will be able to make for their home. We use only the best foundation piers because they deliver the best results. The DynaPier® possesses strength and durability that can not be matched by other piers. When compared to any other foundation pier on the market, the DynaPier® has the edge in engineering, strength & durability. This is why we offer a great warranty on our piers. Let’s take a closer look at the DynaPier® compared to a commonly-used drilled concrete pier. When comparing the DynaPier® foundation pier to the drilled concrete pier, it is easy to see why the DynaPier is the better of the two. The DynaPier® is constructed of steel filled with high-strength concrete which makes it extremely strong. The drilled concrete pier is made up of concrete. The DynaPier® is concentrically loaded meaning that loads are transferred through a single vertical axis which alleviates any fail points. On a drilled concrete pier, the angle of the shaft is not completely vertical, which compromises the durability. 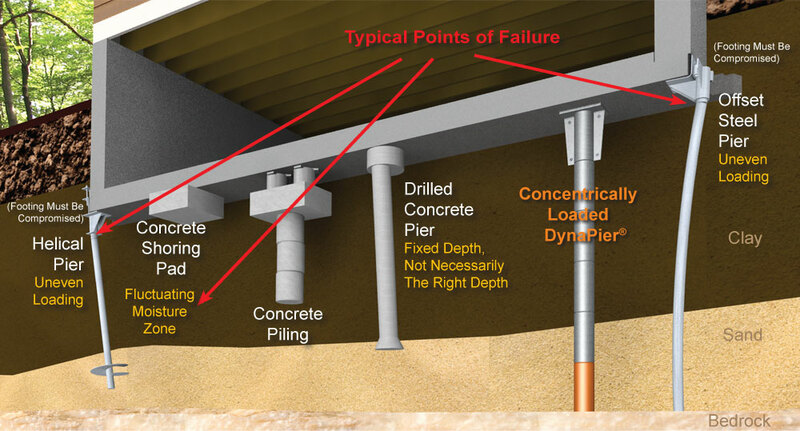 With the DynaPier® System piers are pressed to the point of resistance, where drilled concrete piers are drilled to a fixed depth, which is not necessarily the right depth. Our piers are pressed until they can not be driven any further which guarantees stability. But the drilled concrete piers are friction piers, not end-loaded piers, so they rely on the soil to create friction and press against them to hold them in place. Soil will shrink and expand depending on wet and dry soil conditions which will cause them to fail. The drilled concrete piers require a longer than necessary project time. The holes need to be drilled, then the concrete poured, then the concrete must dry for a week or longer in order to cure and raise the house. DynaPier® piers do not require any additional time for concrete to dry. We show up on the job site ready to go and do not stop the project until it is finished. The DynaPier® system does not require any large excavating equipment which makes for a cleaner job site and one that is less likely to cause property damage. The drilled concrete pier does require large excavating equipment that can be very invasive to the homeowner and can cause damage to the property. These are just a few of the many advantage of the DynaPier® system. Please contact us with any questions or for a free estimate.